George A. Swick, 70, of Easton, Pa, and Harmony Township, NJ, passed away on Wednesday evening, October 1, 2008 surrounded by his loving family. He and his wife wife were currently living with their son, David, in Wilson Borough, Pa.
On November 24, 1937 in Dunellen, NJ, he was a son of the late Russell V. and Anna T. Lansche Swick. Born: He and his wife, the former Beverly A. Freyer, celebrated their 44th wedding anniversary on August 29, 2008. George retired from IBEW Local 102, Parsippany, NJ, where he worked as an electrician for 35 years. He previously worked for the City of Easton as an electrician and, most recently, for Lehigh Valley Catering. 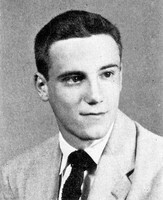 Personal: He graduated from the "old" Easton High School, Class of 1956. He served in the Navy aboard the USS Macon during peacetime, with tours of duty in the Mediterranean, Europe, Cuba, Caribbean, and South America. He crossed the equator for the first time and his ship was chronicled in Life Magazine, as they were the first large ship to go through the locks of the Saint Lawrence Seaway. He was a die hard Easton wrestling fan who followed the wrestlers all over the country; however, his enthusiam for sports was not limited to wrestling. He attended football, girls basketball, and many Easton youth events. He enjoyed watching his grandchildren participate in their activities. George was an avid hunter, hunting mostly in Potter County with his sons, grandsons, and friends. He was of the Catholic faith. He was a lifetime member of Liberty Hose Company, Citizens Hose Company, and Order of the Fleas, Inc., and a member of Saftey First Volunteer Fire Company. Membership: In addition to his wife Beverly, he is survived by two sons, John and his wife, Nancy of Easton, and David and his wife, Lisa of Wilson Borough; a daughter Susan Reed and her husband, Paul of Easton; seven grandchildren, Chyra, John Thomas, David Jr. "Chopper", and Farrah Swick, Ashlee Csicek, and Colton and Dylan Reed; a brother, john of Easton, and two sisters, Dawn Parenti and her husband, Chic of Stockertown, Pa, and Marva Schuler and her husband, Stan of Palmer Township. A sister, Gail Swick Williams, died earlier. Survivors: Funeral services will be held on Monday at 10:30 a.m. in the Strunk Funeral Home, Inc., 302 West Berwick Street, Easton. Calling hours will be held on Sunday from 1 to 3 p.m. in the funeral home. Burial will be in Northampton Memorial Shrine. Services: Memorials may be made to Easton high wrestling Booster Club, c/o the funeral home. Memorials: Memorials may be made to Easton high wrestling Booster Club, c/o the funeral home.